After you have purchased your dining furniture for your patio, you will find that you will need Umbrella Stands for your Outdoor Patio Umbrella for shade. Most sets do not come complete and finding the correct base for your Umbrella will be important. The five different styles of Umbrella Stands we will look at in this article are just a starting point. I had just purchased a small dining set and it came with an Umbrella, just not a stand. After using one time and the umbrella just jumped around in the table hole, I was ready for a stand. Lets look at these five and see what works for you and I will give you my choice on what I thought would work best for me in the conclusion. This base is concrete filled with a plastic cover and powder coated steel post. It is a simple design and the weight is inside a plastic shell. The post has a locking screw to keep the umbrella steady. It is easy to assemble, just insert a screw into the base, place plastic post base and secure the post to the base, no tools needed. Two plastic inserts go into the top, use the right one for the size of your umbrella post. Will take from 1 1/4 to 1 3/4 umbrellas post. It weighs 28 pounds. The base is 14 inches square and the post is 11 inches high when installed on base. Look into a further detailed review of this item at this link. If you need an umbrella stand that can be moved easily or can handle the heavy winds, this one will work for you. 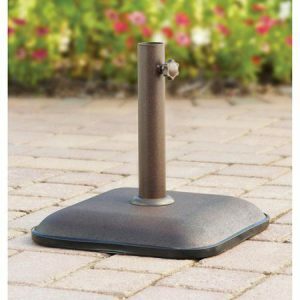 The four legs are made to support paver or patio stones of your choice, sold separately, to keep the stand in place. The grey steel frame is 33 inches across and will be 17 inches tall when post is installed. It weighs 10 pounds without the pavers. Easy to assemble with four screws holding legs to center mount. The post secures to center mount with a screw. Some complained the hold down screw stripped easily when trying to tighten on umbrella pole. Factor in the cost of the pavers or patio stones in the cost of this stand. This square black cast iron base has a elegant scroll design. It would be a great addition to any square patio table. Other Englewood Heights items are available to match the design of this stand. 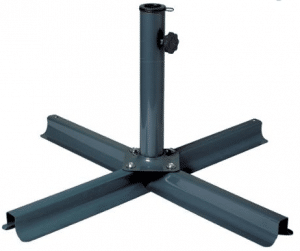 At 17.25 inches square and 11.5 inches tall when post is installed this stand will support any umbrella up to 9 feet. It weighs 27 pounds and will be good in any but the strongest winds. Assembly is just attaching the post to the base and installing the hold down screw. 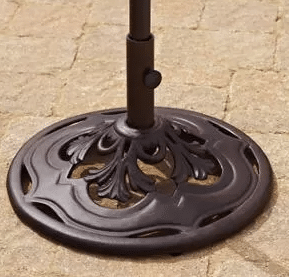 The round black powder coated cast iron umbrella stand will have a leaf design. 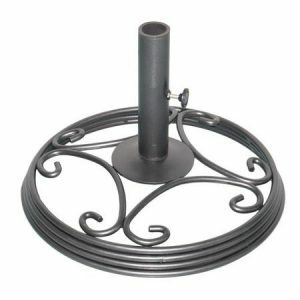 If you have a round patio table this stand will be a nice addition. It is 19.75 inches across and 11.75 inches tall with the post installed. It weighs 27 pounds. Post is made to accept a umbrella with a 1 9/16 inch post. Easy assembly is just installing the post with an Allen screw with the included wrench. This simple design is made from steel bars bent and welded together. It is a very solid design and will hold up for many years. The post has a screw to tighten on the umbrella post to keep the two attached together and a plastic insert to make sure the umbrella does not wobble. The stand will weigh 18 pounds. Your stand will be 20 inches across and the post is about 4 inches high. It will take all 1 3/4 inch umbrella post. Assembly is easy, just two screws attach the post to the base and the Allen wrench is supplied in the hardware pack. Two major concerns about leaving something outside that is made of metal. Make sure if your umbrella stand does not collect water in the post area, if you do not have an umbrella in it put a cap on the top to keep the rain out. If it gets chipped, make sure you find some good outdoor paint to cover the chip to make sure that your do not get rust or discoloring on your base. The only recommended cleaning is a mild soap and water to keep dirt from building up on your base. 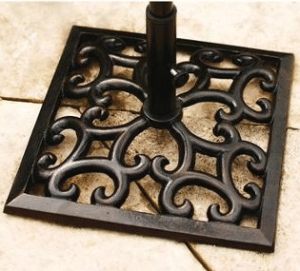 Several Umbrella Stands for Outdoor use are covered in this article. They range in style and weight and this selection can take up to a nine foot umbrella in the right conditions. I can only recommend what I have used, as every persons environment can be vary different. I purchased the Mainstays Lawson Ridge for my small patio set and am very happy with my purchase. When choosing the right one for your patio or outdoor space, you will need to know what size umbrella you have and the amount of wind you will expect. Make sure that you measure the height of the of the table cross brace to make sure the post will fit under it when installed. The bigger the umbrella the heavier the base will need to be. If you live in a very windy area you may have to remove your umbrella on occasion. Those are really nice umbrella stands. I love the designs and how they each have their purpose and use. I just moved to new apartment that has a balcony, so I will surely be looking at patio tables and umbrellas. Your information is super-helpful and I learned how important they are, design-wise to suit different needs. If you live with a limited space, Half Umbrella stands are also available. Chek the amount of wind that you receive, this will help in the weight of the stand that you will need.